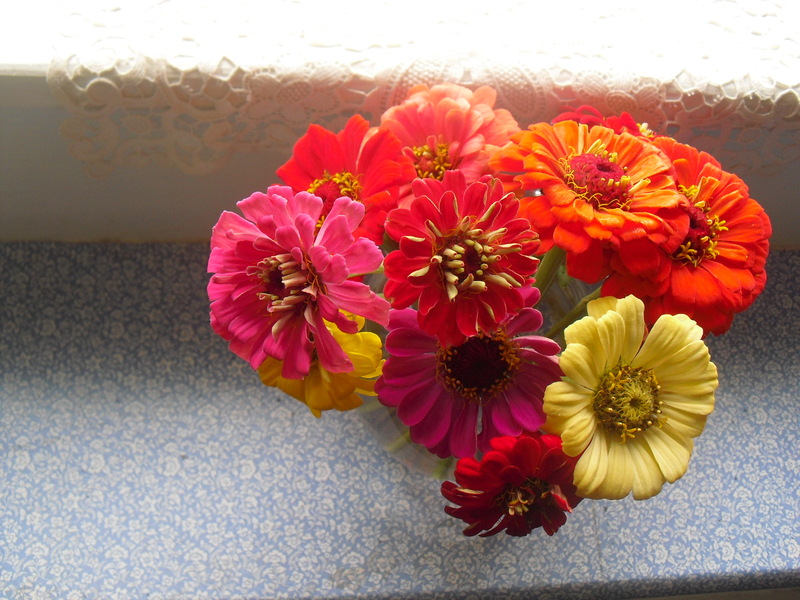 Freshly cut zinnias in late October? It has been an early fall, and the leaves on most of our trees have browned, shriveled, and fled, but our trusty flowers bloom on! We had two dinners at the farm this weekend: our regularly scheduled October dinner and a special benefit dinner for two families, from West Pittston and Fernville, PA, whose homes were devastated by the September flood from Tropical Storm Lee. The menu was autumnal, featuring our own Savoy cabbage and Forks Farm beef in an appetizer of meatballs on cabbage braised with bacon; cauliflower pie with ham; crepes with mozzarella, prosciutto, and tomatoes; our own house-made sausage served with a stew of our potatoes and red peppers; and pears poached in red wine with house-made gelato fior di latte. 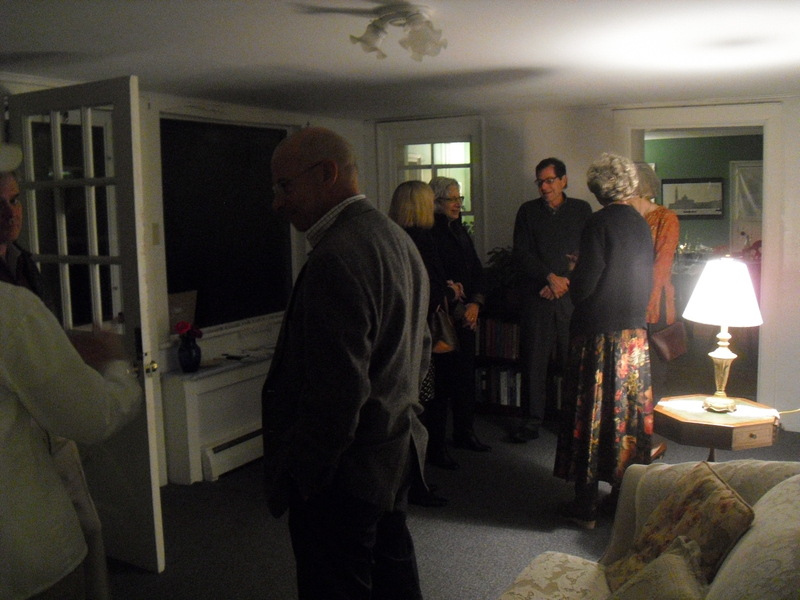 On Saturday night we had a mini-reunion of Philadelphians who have either relocated to this area or still share time between their city and country homes. It was lovely to serve them and see them mingle after the meal. 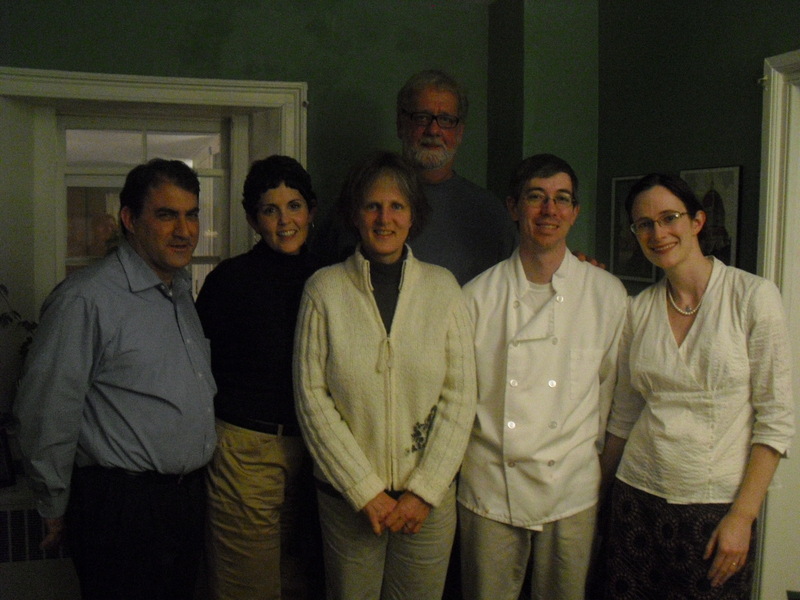 We were especially humbled that one guest said our cooking reminded her meals at Vetri. The great delight in running a rural restaurant is the sense of how rare fine restaurants are outside of a city. This certainly isn’t true everywhere; after travelling in Italy people are often say how exceptional the food was in small, out-of-the-way places. We like to emulate that. We’re proud to be “out-of-the-way” and serving a rural community with a quality of cooking most often associated with urban living in this country. The majority of our guests come from within a 30 miles radius of our farmhouse. The benefit dinner on Sunday night was a real joy. We had chosen two families — one from close to our workplace and one from just south of the farmhouse — whose homes had been similarly devastated by the September flooding in this area that followed Tropical Storm Lee. One family’s home was condemned; the other’s is currently in restoration. Both have lost so much and spent so much time under stress in the past six weeks, we wanted to give them a night of peace, good food, and that magic that always comes with fellowship around the table. So, we invited these two couples to come as our guests of honor, and our other guests generously donated funds to benefit them. It was a night celebrating our past and our present, as old friends who knew me as a child joined with new friends who know our children. There was abundant warmth and fellowship at the table, and the tastes and smells of autumn in Justin’s cooking. We are humbled and blessed by the community that surrounds us.